The Pizza Files: The Binge Part 11, unplanned bonus. Today BBQ came up to the top pretty quick and Stumpy's House of BBQ stood above the rest. That was just fine with me, as it meant I could do both Pizza and BBQ... That's how Cecil Whittakers Pizzeria became Part 11 of the Pizza Files 2009 Summer Binge. On the menu today was a small pizza with pepperoni, Canadian bacon, hamburger, red onions and mozzarella cheese. On the BBQ side there was a Stumpy's Salad with pulled pork, ranch dressing and sweet BBQ sauce. If you are looking at the photos above your probably thinking I see the pizza and the salad, but what's in the third photo? Well, that my friends is an order of deep fried pickles. Not something I would ever order, but I will on the next visit. Dip the pickles in some ranch dressing or not and they were excellent. No Kidding. 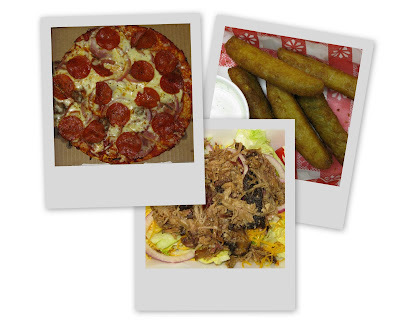 Click on the Title link to see my review of Cecil Whittakers Pizzeria and Stumpy's House of BBQ.